Turbomachinery, such as compressors and turbines, is widely used in aircraft, automotive, marine, space and industrial power generation. These machines are made of multiple stages of rotors and stators in constant rotating environment, which generate very complicate flowfield. To achieve ultra efficiency for modern propulsion and power systems, there is a strong need to understand the physics of such flows. Traditional wind tunnel test is the most straightforward way to enable such understanding; but it comes with high costs and constraint on placing the measuring probes. Numerical simulation using CFD techniques has been shown in recent years as an alternative way to study such flows. CFD has the advantage over experiment in cost and unconstrained placement of measuring probes. However, the accuracy of a simulation depends on the accuracy of the mathematical model that makes up the simulation. At Ohio State, we focus on developing and applying modeling techniques that are special to turbomachiney. 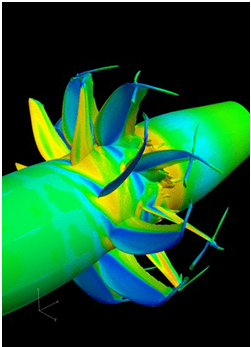 Our physics-based simulator can perform fidelity aerodynamic simulation of entire compressor and turbine systems. 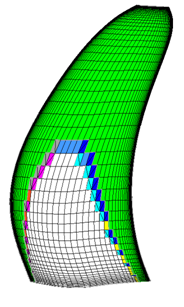 We developed special boundary conditions to account for abnormal flows such as rotating stall and flow control as well as coupled fluid/structure interaction model to simulate open rotor blades undergoing vibration. The combined knowledge of CFD and rotating fluids put us in a unique position for turbomachinery simulation. Balasubramanian, R., and Chen, J.P., “Preconditioned Algorithms With a General Equation of State for Rotating Machinery Flows”, AIAA paper AIAA-2010-4862, 40th AIAA Fluid Dynamics Conference and Exhibit. Chicago IL, 2010. Shyam, V., Ameri, A., and Chen, J.P., “Analysis of Unsteady tip and Endwall Heat Transfer in a Highly Loaded Transonic Turbine Stage,” ASME paper GT 2010-23694. Memory, C., Bons, J., and Chen, J., ‘Numerical Simulations of Vortex Generating Jets on Low Pressure Turbine Blades, AIAA paper AIAA-2010-0090, 48th AIAA Aerospace Sciences Meeting and Exhibit, Orlando FL, 2010. Chen, J., Johnson, B., Hathaway, M., and Webster, R., “Flow Characteristics of Tip- Injection on Compressor Rotating Instability via Time- Accurate Simulation,” AIAA paper AIAA-2010-1604, 48th AIAA Aerospace Sciences Meeting and Exhibit, Orlando FL, 2010. Herrick, G.P., Chen, J.P., and Hathaway, M.D., “Unsteady Full Annulus Simulation of a Transonic Axial Compressor Stage,” AIAA paper AIAA-2009-1059, 47th AIAA Aerospace Sciences Meeting and Exhibit, Orlando FL, 2009. Barrows, S.T., Balasubramanian, R., and Chen, J.P., “Investigation of Tip Clearance Modeling Techniques for a Transonic Compressor Rotor,” ASME paper GT 2009-60136. Pluim, J., Memory, C., Bons, J., and Chen, J.P., “Designing a High Fidelity Wake Simulator for Research Using Linear Cascades,” ASME paper GT 2009-59276. Shyam, V., Ameri, A., Luk, D.F., and Chen, J.P., “3-D Unsteady Simulation of a Modern High Pressure Turbine Stage Using Phase Lag Periodicity: Analysis of Flow and Heat Transfer,” ASME paper GT 2009-60322. Cameron, J.D., Morris, S.C., Barrows, S.T., and Chen, J.P., “On the Interpolation of Casing Measurements in Axial Compressors,” ASME paper GT2008-51371. Bennington, M.A., Cameron, J.D., Morris, S.C., Legault, C., Barrows, S.T., and Chen, J.P., McNulty, G.S., and Wadia, A.R., “Investigation of Tip-Flow Based Stall Criteria Using Rotor Casing Visualization,” ASME paper GT2008-51319. Balasubramanian, R., Barrows, S.T., and Chen, J.P., “Investigation of Shear-Stress Transport Turbulence Model for Turbomachinery Applications,” AIAA paper 2008-0566.